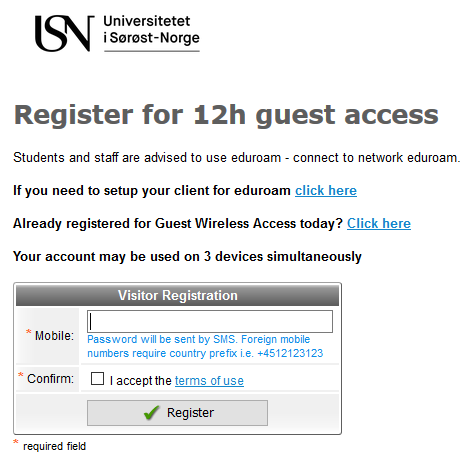 Select USN-guest from Wireless Network Connections. - Open a web browser (Chrome, Internet Explorer, Safari) and go to www.usn.no You will now be forwarded to the College’s login page for the guest network. Register with your mobile phone number, and you will receive a password by SMS. - Enter the password you received in the form “Login with SMS password”, and press “Login”. You are now connected to the guest network.